Finally "She" has her own page. Just for doodles. I will be posting new doodles here and asking from time to time for help in titling pieces. 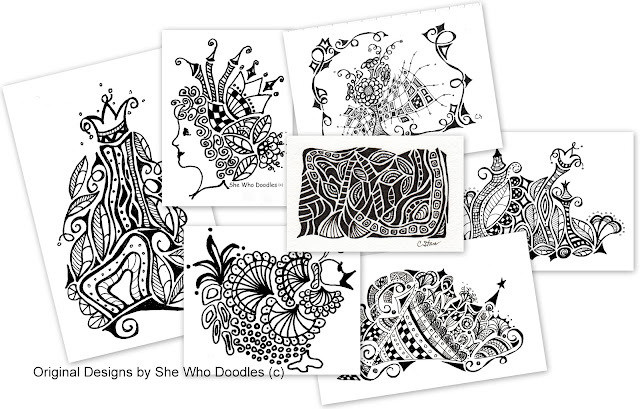 And I hope to be able to keep you updated on the market, as to where you can find my doodles. Please check back, you can also follow She Who Doodles on Facebook. Here's a few of my designs and many more to come. I have them on aprons, tote bags, cards, coasters and more. Thanks for visiting, I love comments. So what do you think, look Ok, any suggestions? Yea! I like the new place and look forward to seeing lots more of your doodles. Congratulations! I've got to build one for my photography. Have the domain and it will be hosted by Typepad, but I have no idea what it should look like. Love this!